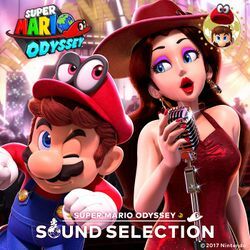 The Super Mario Odyssey Sound Selection is a digital soundtrack for Super Mario Odyssey released on the iTunes Store on December 22, 2017. It features a selection of 12 songs from the game, which includes four versions of "Jump Up, Super Star!" and both the English and Japanese versions of "Break Free (Lead the Way)" performed by Kate Davis and Aimi Mukohara. 5 Jump Up, Super Star! NDCフェスティバルエディション Jump Up, Super Star! 9 Jump Up, Super Star! ～オデッセイでっせい～ Jump Up, Super Star! ~Odyssey, ya see~ Jump Up, Super Star! 11 Jump Up, Super Star! カラオケ（ショートバージョン） Jump Up, Super Star! Karaoke (Short Version) Jump Up, Super Star! 12 Jump Up, Super Star! ～オデッセイでっせい～ カラオケ（ショートバージョン） Jump Up, Super Star! ~Odyssey, ya see~ Karaoke (Short Version) Jump Up, Super Star! This page was last edited on January 18, 2018, at 15:07.